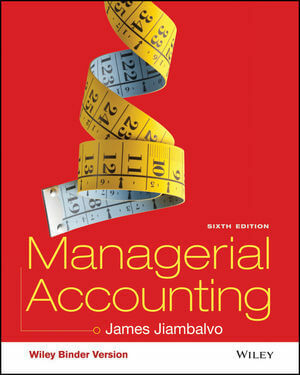 Recognizing that most students will pursue careers as managers not accountants, Managerial Accounting, 6th edition by James Jiambalvo focuses on the fundamental topics of managerial accounting, and helps student make direction connections between techniques in the business world, and readers’ future careers using real cases and real managers’ comments on real company issues. Managerial Accounting, 6th edition helps students develop decision making through incremental analysis and stresses the fact that you Get What You Measure throughout the program. It is designed for a one semester managerial accounting course at both the undergraduate and MBA level. Dr. James Jiambalvo joined the accounting faculty at the University of Washington and has served on the national academic advisory board of Deloitte & Touche LLP. Professor Jiambalvo has served as chairman of the UW Accounting Department and he holds the PricewaterhouseCoopers and Alumni Endowed Professorship. Professor Jiambalvo's research has been published in the top accounting journals including The Accounting Review, Contemporary Accounting Research, the Journal of Accounting and Economics, and the Journal of Accounting Research. •NEW Organized Learning New and streamlined learning design of both WileyPLUS and the text helps students find relevant videos, reading content, and resources based associated learning objectives, so they can make the best use of time outside of class. • NEW Practice Made Simple New algorithmic brief exercises, DO Its, exercises, and problems available outside of instructor assignments provide opportunities for no-stakes practice and show answers and solutions as students check their work. • NEW Solution Walkthrough Videos Author Jim Jiambalvo walks students step-by-step through solutions to over 50 homework problems. Based on problems that are “similar to” (but not the same as) the problems students will find in their homework assignments and are available within the eText and as homework assistance. • NEW Revised Excel Templates New templates offer “What if?” scenarios to help students apply their understanding of Excel and chapter concepts from different perspectives. NEW Organized Learning New and streamlined learning design of both WileyPLUS and the text helps students find relevant videos, reading content, and resources based associated learning objectives, so they can make the best use of time outside of class. NEW Practice Made Simple New algorithmic brief exercises, DO Its, exercises, and problems available outside of instructor assignments provide opportunities for no-stakes practice and show answers and solutions as students check their work. NEW Solution Walkthrough Videos Author Jim Jiambalvo walks students step-by-step through solutions to over 50 homework problems. Based on problems that are “similar to” (but not the same as) the problems students will find in their homework assignments and are available within the eText and as homework assistance. NEW Revised Excel Templates New templates offer “What if?” scenarios to help students apply their understanding of Excel and chapter concepts from different perspectives. WileyPLUS with ORION addresses the challenges of student readiness and retention, and helps instructors and students improve learning outcomes by integrating course content with learning tools, assessment, and practice activities within one adaptive platform. Based on cognitive science, ORION provides students with a personal, adaptive learning experience so they can identify what they know and don’t know early, build their proficiency on topics, and use their study time most effectively. WileyPLUS with ORION helps students learn by learning about them.